Need a Screen in your Gym? Not only is this a great concept and fun, but it provides some insight into the daily tools, resources and handy gadgets utilized by the teachers featured. In addition to the actual items themselves the posts so far have given me food for thought relating to things that are NOT in my bag but perhaps should be, especially when it comes to improving efficiency and workflow. Since my feature I have received a few requests for info about some of the items in my bag, specifically my mini projector, “Pico”. Generally, I don’t blog a great deal about specific tech items or specific apps. This is simply because I think we often can be fixated on the tool and not the outcome, or the why behind its use. In this case I’m happy to make an exception. 1. Because it’s such a simple, practical item with a myriad of uses all related to enhancing learning. 2. Because of the amount of requests I had for more info about it, I figured a blog post would provide the info that everyone wants! 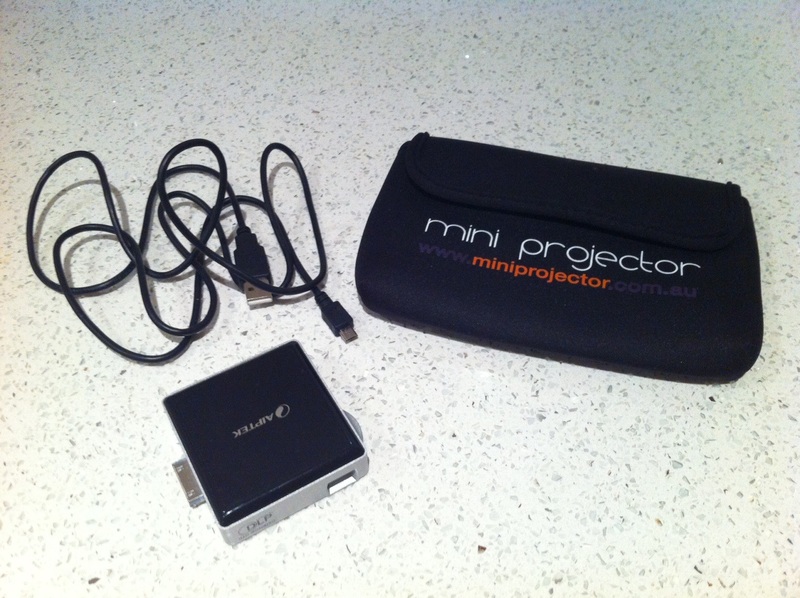 I’m not entirely sure if they’re available directly from the manufacturer AIPTEK (probably) but I got mine from the friendly team at www.miniprojector.com.au which is an Australian based company from Sydney. I’d like to say I’m not being paid to plug this company or product! I called them re an invoicing query after purchasing and had a terrific chat to the team there, they were very helpful and I was even able to follow up via email with a few questions, which they answered promptly. I said I was keen to get it and try it ASAP and they agreed to express post it to me, it arrived the next day! So the service was great. But I’m not sure what their policy is on international shipping for all you international Team #PhysEd-ers. It is so mobile. Previously I would set up a data projector on a trolley which would take up some space in the gym, also the risk of something or someone hitting it, not to mention the cables which could be a concern during some practical activities, with some year levels. With the ‘Pico’ there is no table required (although sometimes a table or some platform will help keep it still, or your hands free). At times, it goes straight in my pocket after showing a small group something. It also could be used outside in certain scenarios, light would be an issue no doubt though. But I’m figuring in changing rooms for a coach at half time for example they would be able to show evidence of footage to get a point across. 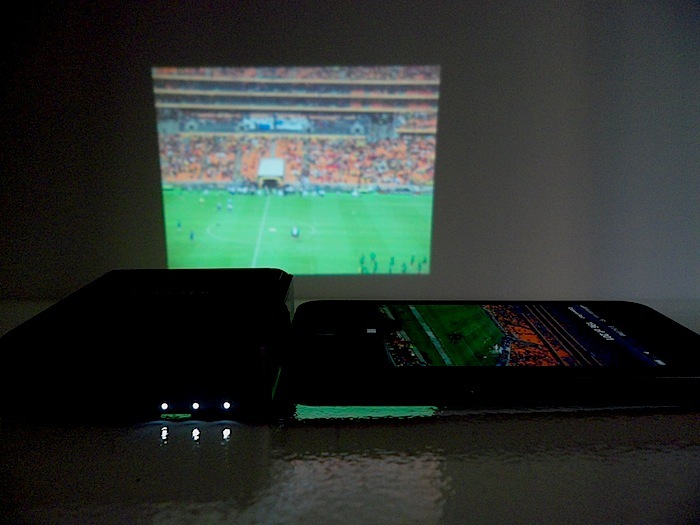 At home it works a dream in the dark against a wall or against drop blinds to watch a movie or sport. As with all technology there are a few things to note before declaring it the best gadget in history! The lumens (the power of light projection) are not terrific as you would expect from something so small, compact and not backlighted. I think there is a mini on the market which is one up from this version which may give some stronger light. It works perfectly from about 2m out from the screen/ wall but any further and it begins to fade. Sometimes I have wanted to pull it out to get a bigger projection and I’ve had to use the old one. That’s the price you pay I guess for the remote, wireless ‘handy-ness’ of the device. It has a required function called ‘TV Out’ which provides the capability to play what is on the iPhone/ iPad out onto the projector surface. Some apps have it built in, some apps don’t. Apparently you can get apps which allow this capability across the board (GO Universal being one) but I haven’t tried yet. An example, I realised early that youtube wasn’t projecting from the app but it works from safari or google chrome via the internet. I’m still playing around with this to get a consistent solution. Overall, this new tool, has given me a wonderful new set of options for providing ‘screens’. 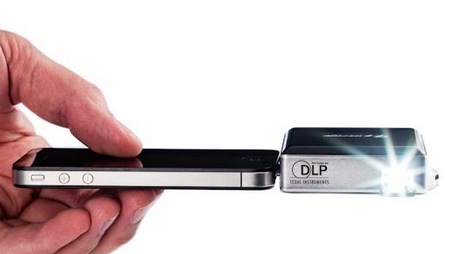 Its quick, easy, wireless and really, really compact. For presenting to other staff or workshops it’s absolutely perfect. But considering the above cons are also worthwhile. It’s not the perfect answer to all problems. One of the many reasons I LOVE my job as a Teacher is the endless opportunities it presents to enrich the lives of young people. Like most teachers I know, I do not treat this lightly. Kids are the most precious part of any parent’s life and we are entrusted to do the best by them, and for them, in every single interaction. And so we should. The mission statement of our school is to enable quality learning every day, in every experience, for every learner for life. No mean feat! The key words being quality and every. The task of ensuring we teachers are at our best every day, in every experience for every student is a challenge for sure, but one we must tackle with courage, determination, imagination and some humility. Accepting we are not perfect, that we will have bad lessons, days, or even weeks is an important part of our emotional approach to this wonderful profession. But ask yourself; are you constantly looking to improve? Do you actively pursue and seek out new ideas? Are you willing to take risks with your teaching, just as you ask your students to take with their learning? Only you can answer these questions. If you answer in the affirmative then you are no doubt pursuing excellence and “becoming” a better teacher. I never get tired of saying that I thought I became a Teacher when I graduated from university with my teaching degree, I understand now that I am, and will always be, “becoming” a Teacher. There is a lot of buzz these days about life-long learning, both encouraging this in our students and also modelling this as teachers. Without any hard data I would guess there are a lot of teachers out there who could be described as ‘coasting’. Comfortable in their basic ability and happy to roll out programs and practices year to year. The slightly self-satisfied, “If it’s not broken, why fix it?” policy. If they are honest they would admit this, and I know for sure the students in their class(es) would certainly sense this. The road to becoming a great teacher is dotted with many tempting parking places. What we do have evidence of is that teachers tend to improve fairly rapidly in their initial two years of teaching (Rivkin, Hanushek & Kain 2005). The reason for this, as suggested by Dylan Wiliam, is that the environment of teaching is so difficult, you are forced to improve. You get better because the environment is making you improve. I actually remember this feeling. The Initial years of teaching are what we may call ‘a steep learning curve’. Making lots of mistakes, but also learning a lot in the process. 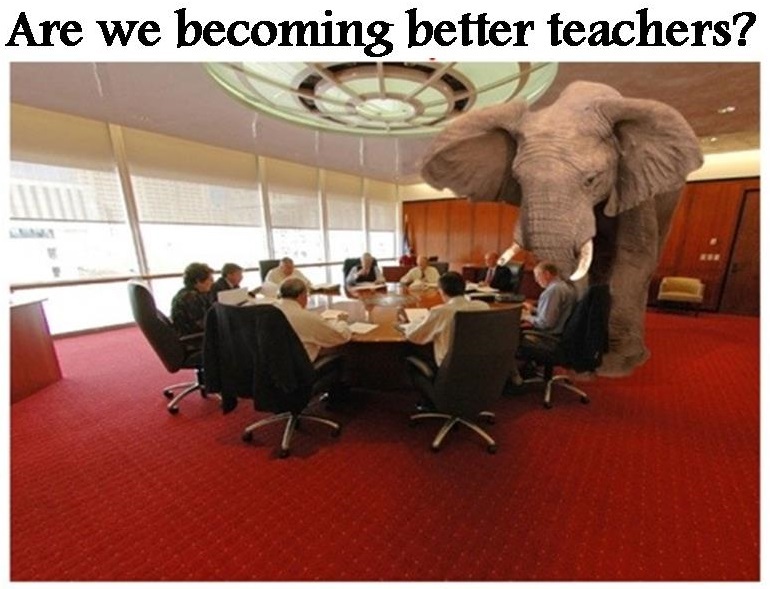 Well the research suggests that all teachers slow and most teachers stop making any significant improvements to their practice after their first 4 years of teaching. In simple terms, they steer into one of those parking spaces and settle in for the next 40 years. I wonder why so many are willing to accept this. I do not have the answer. I know some common complaints may be that professional learning or development is boring, not relevant, fails to achieve a sustained impact on practice etc etc. I do not subscribe to these types of complaints. These are to suggest that improving your practice as a teacher is someone else’s responsibility. It’s not. It’s yours. And you owe it to all those faces staring back at you on a daily basis to be your best, or at the very least in search of your best. Recently, I have been handed the privilege to present to other #PhysEd professionals at the 2013 ACHPER International conference here in Melbourne, Australia. I am both excited and humbled by this opportunity to share ideas and to explore some of what I am currently doing in my classroom as well as analysing some of the things I have shared on the pages of makingpefizz.com. I have no doubt this will be wonderful learning opportunity for me. While I plan to include practical everyday strategies that teachers can take away and use immediately, I am even more interested in tapping into how THEY can take ownership of their own professional learning via observing and sharing with colleagues, using social media and pro-active professional learning networks like peplc.net. It is important to me that teachers attending realise the potential that THEY have to make a difference and that they ‘keep on keeping on’ long after my little workshop concludes. One thing I know is that I’m certainly still becoming a teacher and don’t have all the answers. What I’d like to know is, what things have you learnt that changed your teaching? What kinds of professional learning have made an impact on you? As I plan to offer advice to a group of teachers of various experience, what advice would you offer me?